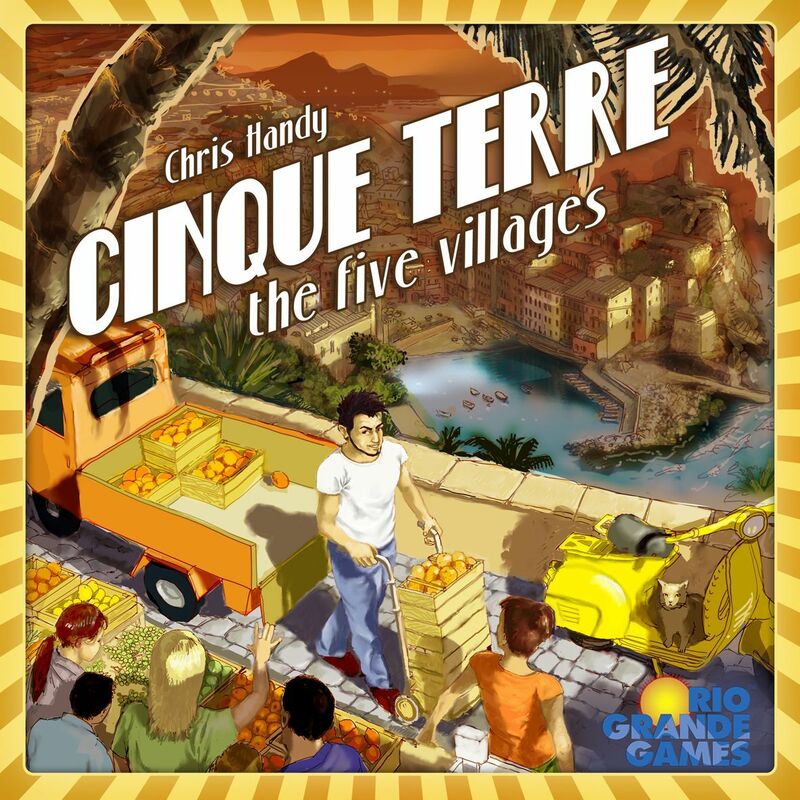 During setup in Cinque Terre, colored dice are randomly pulled from a cloth bag and rolled to establish the prices each village will pay for select produce. Each player also begins play with a private order only she can fulfill. Five public orders are turned up that all players can work on, though only the first player to fulfill each public order will score points for it. The Most Popular Vendor cards (1 for each village) are placed face up along one side of the board. The first player to fill an entire row with produce cubes for a particular village earns the Most Popular Vendor card for that village, which provides bonus points. Four Produce cards are turned face up and each player receives 4 to begin with along with a Fulfillment board and Produce Truck in their color. Take a Produce Card - either a faceup card or one from the deck. Move your Produce Cart up four spaces clockwise around the board. Harvest produce from the location your cart is currently at. Each produce cube you wish to harvest requires a matching card. Two identical cards can be used in place of any one other card. Your cart can hold up to 4 produce cubes at a time. Deliver produce to a village. Unload the produce cubes you wish to deliver and place them in the appropriate spaces for that village on your fulfillment card. At the end of your turn, if you complete a public order or achieve Most Popular Vendor, take the appropriate card, scoring the points indicated. You can only complete one public order per turn. When you complete a public order, you must draw a new card from the Order Deck. If you would like to keep that card as a private order, add it to your hand and draw another and place it face up to replace the public order just completed. If you do not wish to keep the card you drew as a private order, place it face up instead. Any private orders not fultilled by game end count as negative points against you. Players take turns taking their 3 actions until one player has completed 5 public orders (Most Popular Vendor Cards also count as public orders for determining game end), then everyone gets one more turn, including the player who caused the game to end.